Christchurch is a lively, growing church with something for everyone! We love welcoming guests, especially on Sunday mornings, and are passionate about helping people take steps in their spiritual journey. We’re a Christ-centred community where people can serve Christ, grow to be like him and reach out to others with his transforming love. We hope you enjoy exploring more on this website! We are an inclusive, welcoming church where most Sunday morning services at our Peartree site provide some access through British Sign Language (BSL). 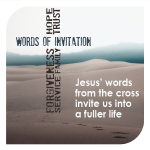 Join us on Friday at 11am on Howardsgate as we meet with other churches in WGC for our outdoor Good Friday service. It'll last about 45 mins and all welcome. We also have a Maundy Thursday service at 8pm at Parkway. And then Easter Sunday services at both sites. Church meeting happening tomorrow evening - 12th March 8pm Peartree. Come and listen, discuss, and pray about our life as a community of Jesus followers and where God is leading us. Thanked God today for His faithful hand upon Christchurch over the 90 years since it was formed. Roll on the 100th celebration! online, via the offering box in one of our services or via a standing order.